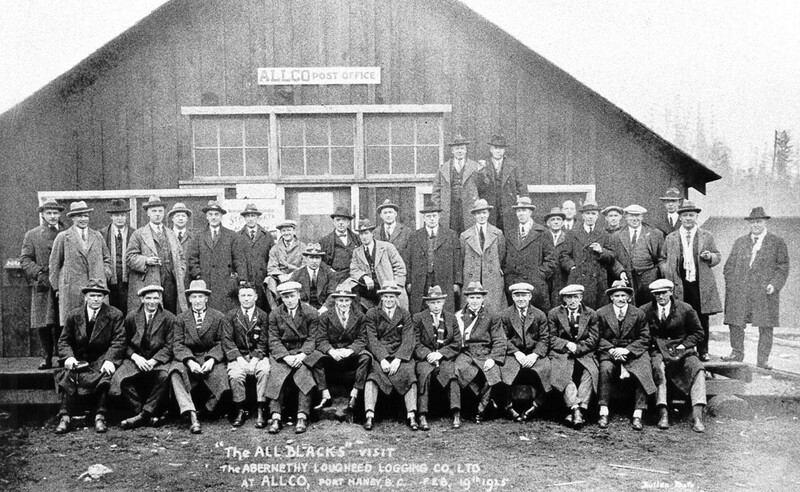 Allco was the acronym for the Abernethy & Lougheed Logging Company which won the contract to log the area around Alouette Lake prior to the flooding behind the dam set for 1925-26. It was also the name given to their main camp on the Alouette River, which today is the location of the Alouette Correctional Centre for Women. The New Zealand All-Blacks rugby team posed in front of the Allco post office during a visit in February of 1925. By 1923, there was such a substantial population living at Allco Camp that it warranted a post office of its own. It was the last separate neighbourhood post office created for Maple Ridge. In 1929, the economic collapse brought bankruptcy to Abernethy & Lougheed and they shrank their operations back to the original Eburne Sawmills. Another company took over logging in the region but they were burnt out by a terrible fire in 1931. The camp then stood idle for a few years until it was taken over by the provincial government as housing for indigent men during the “dirty 30’s”. Men working on government sponsored infrastructure projects would live in the camp and be taken to work sites each day. As the economy recovered, the camp gradually metamorphosed into an infirmary for men without families suffering chronic illnesses — usually as a result of work in the forest or mining industry or as a result of war injuries. It became a part of something called the Marpole Infirmary which had branches all over BC that were supervised by RN’s with a doctor on call. We often get family history research requests from people wondering how their ancestor managed to die at a place called “Allco” when they never appeared to have lived there. Allco Camp served men near the end of their lives and many died there by natural causes or at their own hand due to chronic pain. In the 1960’s, the Social Credit government closed the infirmaries and the Allco site was transformed into a low to medium security prison which is operator of the Alouette Fish Hatchery. View archival photos of Allco Infirmary at our Flickr site.